Jonathan laughing: one of the sweetest sounds this side of heaven. I've been asked a lot about what kind of work we did, what our mission was, in Zambia. That has been a hard question to answer and is probably the main reason I haven't blogged about it before now. Truth is I felt kind of funny that I couldn't pinpoint anything tangible that we did. Truthfully, on the surface it hardly seemed like we made any difference at all. But you know what? This particular trip was not about doing, so much as it was about being. It was about people and relationships. It was about images stepping out of the brochures and infomercials and stepping into my life; living, breathing, laughing, and loving. It was about moving beyond giving money to a cause to putting names and faces in our hearts. Our verbal communication was limited, but still our hearts were knit together. By the time our trip came to an end, the orphans in Choma and the people of Chibwe became a part of us and I believe we became a part of them. 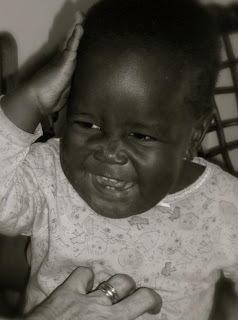 So my memories of Zambia don't consist of tasks and duties, but of faces, smiles, tears, and laughter. Today, my thoughts are with Jonathan. He is one of the babies we met at the orphanage in Choma. I never got his story, but I'm sure it wasn't much different from any of the other children there whose parents were lost to AIDS or who were HIV positive themselves. He struck me because he was so quiet and looked so sad, like he might burst into tears at any moment. He sat on my lap and I talked to him, still his expression didn't change. I wondered about what his eyes had seen and what his heart had felt in the short time he'd been on earth. In contrast to my experiences with my own laughing nephews and nieces, Jonathan was eerily quiet. Then someone discovered that Jonathan was ticklish! She tickled him and the corners of his mouth turned up slightly. She tickled him again and a small sound escaped his lips. She tickled him a third time and he flashed a toothy grin. Finally he broke out into full laughter his right arm up and his little body rumbling. It was music to my ears and reminded me that some things, like laughter, are common to all of us if we would take the time to draw them out. I don't feel like I "did" anything per say, but I got a sense as our time there came to an end that these little ones appreciated us taking the time to come and spend some time with them, to play with them, and talk to them. Things we take for granted or take lightly, yet it means the world to them.